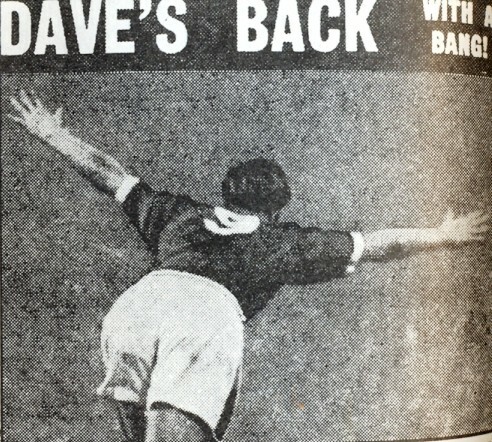 Two goals make Dave's dream debut - LFChistory - Stats galore for Liverpool FC! The day after Dave Hickson's switch to Liverpool from Everton, he made his debut vs. Aston Villa. The match report is from Liverpool Daily Post on the Villa game on 7th November 1959. Temptation to open with "once upon a time" is obvious but discretion dictates a pause for the "lived happily ever after" conclusion, for this really was a fairy tale for dashing Dave Hickson, not a story of immediate and spontaneous success, but a gentle build-up to an explosive finale. How absurd were the fears that Liverpool supporters would not take to an Evertonian! Hickson was as much the hero of Anfield on Saturday as ever he was of Goodison Park. What a day for him to remember! He made his appearance to a roar which only Liddell could previously command, a supporter raced right across the pitch to embrace him, and yes, kiss him on the cheek, and how the crowd loved it! I apologise, but for the most part, this must be the Hickson story. 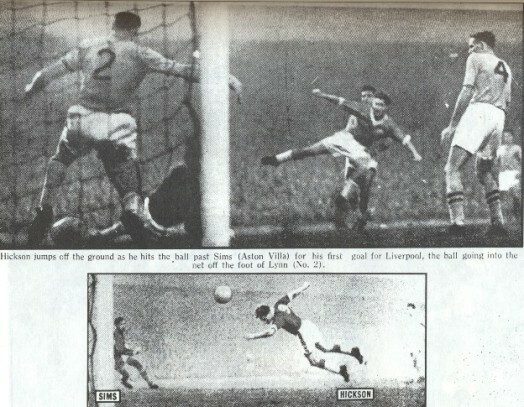 Every time he touched the ball with a flick of the head or a push of the foot, there were murmurs of appreciation, an acknowledgement that Liverpool had a master of his craft in position again, but so tight was the Aston Villa defence, with Dugdale breathing down Hickson's back, so magnificent in its cover, that goals threatened to be almost as rare as swallows in December. With 54 minutes gone came the greatest ear-splitting roar Anfield has known this season. Hickson had scored and what a reward of persistance and perseverance it was. Seemingly he had taken the ball too close to the by-line to give himself a reasonable opportunity, but he crashed in a shot, which rebounded from the legs of a defender and back to Hickson went the ball. Hitting the ball hard and true he saw Lynn just touch it with his leg but it made no difference. Slightly deflected from course though it was, here it was a Hickson goal all the way. His dance of triumph became a communal jig as the elated Liverpool players smothered him with their congratulations. Villa, like the impressive side they are, were most dangerous when wounded. That goal really had stung them deeply and within five minutes they were level. A game which have never been dull or featureless now became electricity charged. Thomson took everybody by surprise except Rudham with a quickly taken free-kick and it was a masterly save by the goalkeeper that kept Liverpool on terms. A' Court, who had much the better of his tussles with Lynn almost thoughout, forced Sims to an equally exhibition of the goalkeeper's art, with a shot flicked over the bar. Neal thwarted Hunt with a split second clearance and crescendo was not far away. Molyneux flashed a ball across Villa's goal and the defence was beaten. Up went Hickson and his flying header had the ball in the corner of the net. It was a magnificently taken goal. Small wonder, with victory in the air, Anfield erupted. Dave had found a new home, where adulation, spontaneuos and overwhelming, promised to outdo anything he had known before. It was the end of the scoring but the remaining eight minutes were only a brief interruption in the expressions of hero-worship. Like a Test-match bowler, who has routed the opposition, Hickson was pushed to the front of the players as they made their way off the field and from every corner of the ground the crowd stood in acclamation. Hickson, could only shake his head, almost in disbelief. He need not to have rubbed his eyes. This was no dream. It was true. Hickson had arrived at Anfield. No matter what fee Hickson cost Liverpool it must have been nearly £2000 less by the time this game was ever. Instead of the 35,000 or so attendance which might have been expected, there were 49,981 spectators, the biggest gate since March 1958. Hickson is the tonic Liverpool needed. This season becomes recharged with possibilities.